Oyaki in Japan are the steamed dumplings that you find on the main street of Nozawa Onsen. 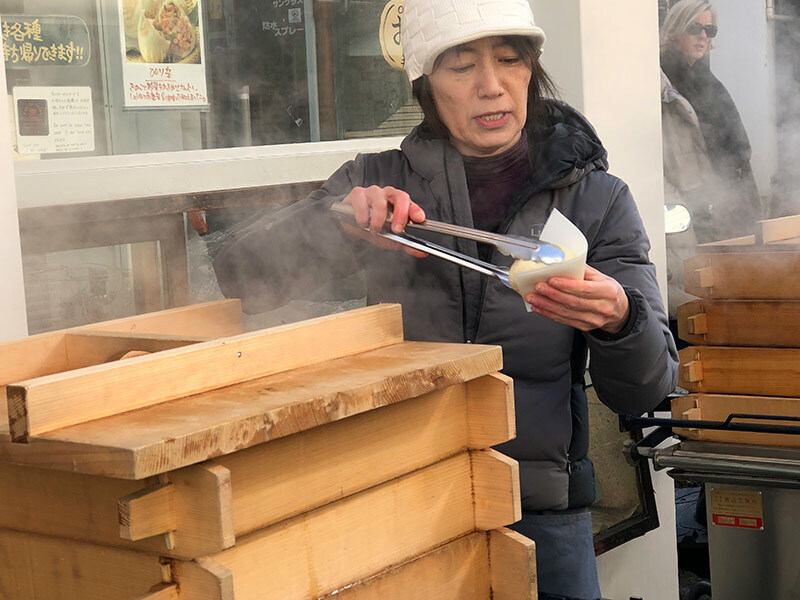 Undoubtedly they are to be found elsewhere throughout Japan, particularly in the Nagano prefecture, but they are synonymous with the beautiful ski village of Nozawa Onsen. This is the comfort food that we all identify with this in this pretty little village. 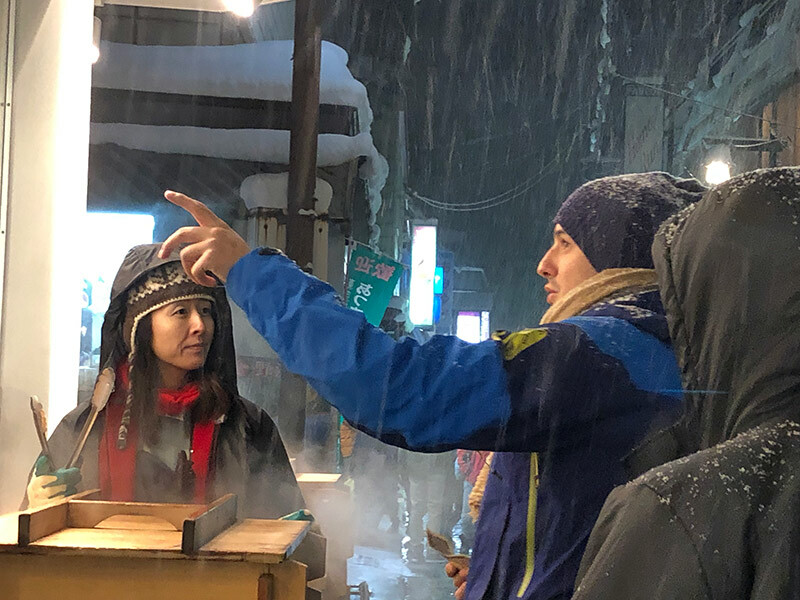 As the snow falls, you can see the steam rising from the wooden boxes as you meander up the street after having an onsen or a coming home from a hard day of skiing though powder on the slopes. You feel good; you feel at home. This is Japanese street food at its best. This is Nozawa Onsen. 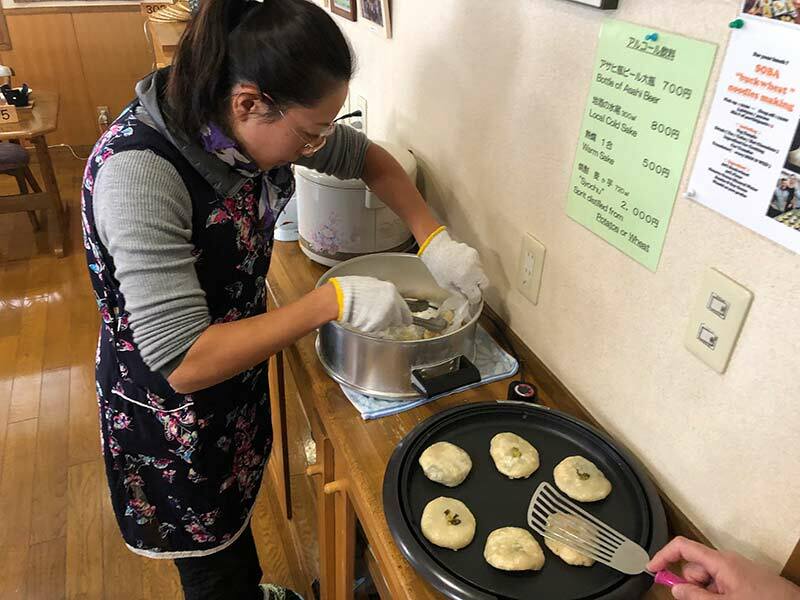 From fillings like the incredible Nozawa apples, to field mushrooms to Nozawana, a local vegetable to red bean paste and even the very popular pork, you know you have found the Japanese Savoury Buns (Nozawana Oyaki) from the queues forming outside these steamers. Don’t worry, it doesn’t take long to get served and at 200 yen they are exactly what you need…often. One thing we all agree upon is that oyaki are Oishi – Japanese for delicious. 2 So what is Oyaki? 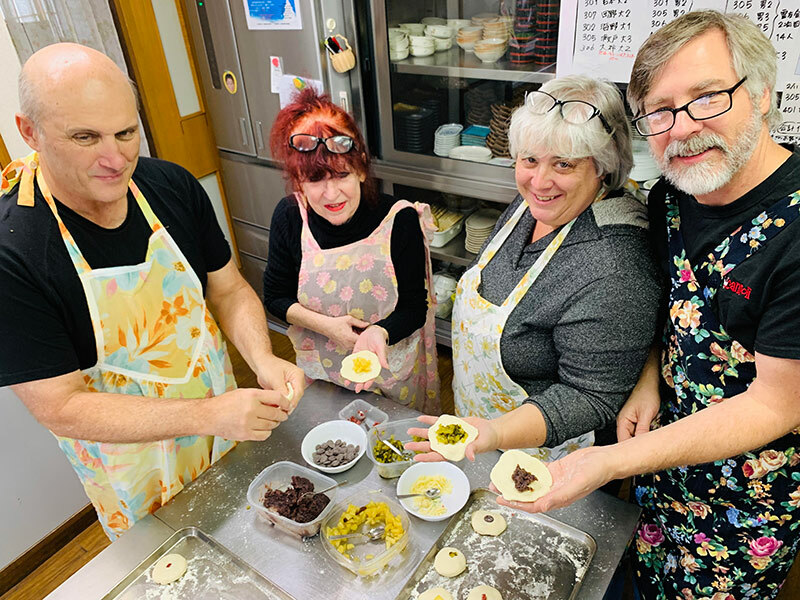 We decided that we would learn to make oyaki on our last trip in January, so we booked into a cooking school. Sometimes you just need a day off the slopes and away from the intense powder. Don’t yell at me. We were very fortunate to be joined by our fellow travel writers Corinne and Jim of ReflectionsEnroute to share this fun experience. We learned that there are differences in oyaki and differences in how they are made. We also learned that as with most things Japanese, there is an art form to making them. Suffice to say we still have a lot to learn. It has been described as Japanese soul food, Japanese street food and definitely Japnese comfort food. 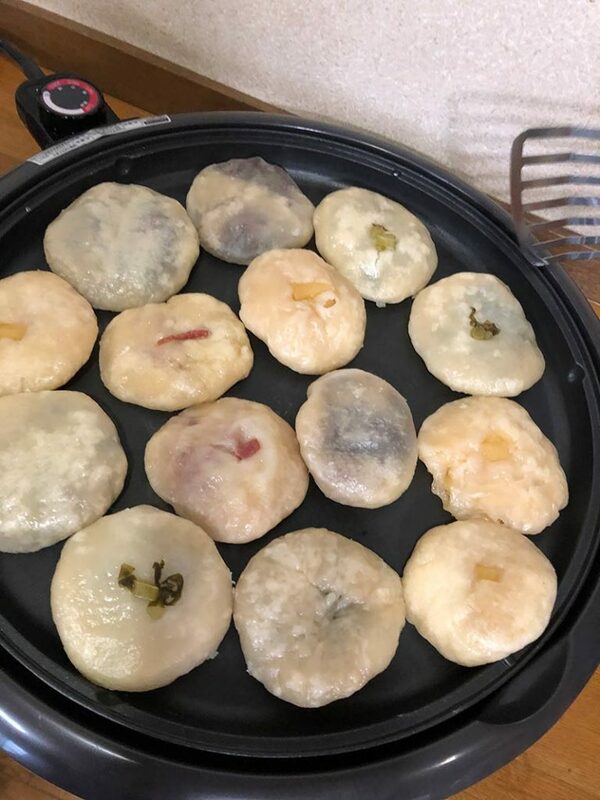 Oyaki is basically a flour dumpling filled with various vegetables often mixed with miso paste and soy sauce for seasoning and cooked in a steaming wooden box. Oyaki was and is comfort food. Traditionally families would sit around an open griddle and eat together on a cold snowy night. It is a speciality of the Nagano region, and Nozawa Onsen is close by. 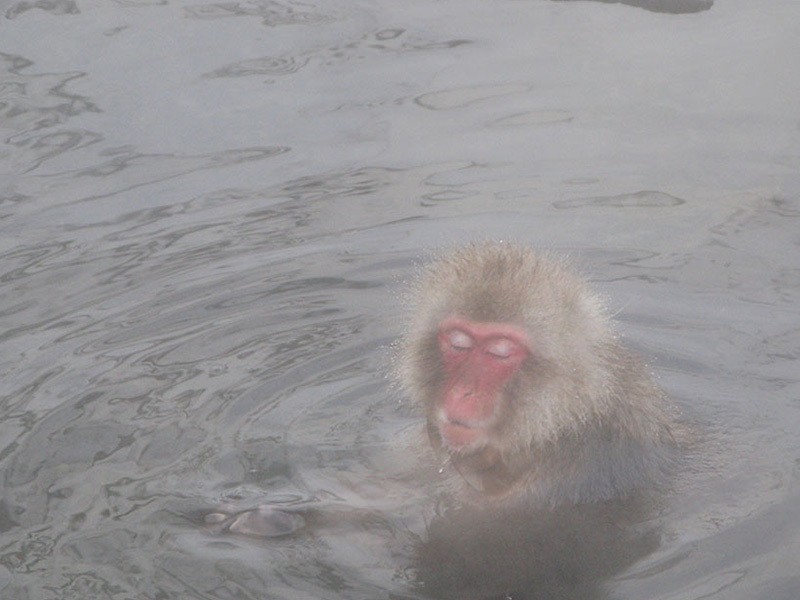 You can even go and see the snow monkeys of Japan which are also close by too just as an aside. Nagano Prefecture’s steep mountains and cold climate made rice cultivation difficult and produced poor yields in pre-industrial Japan. 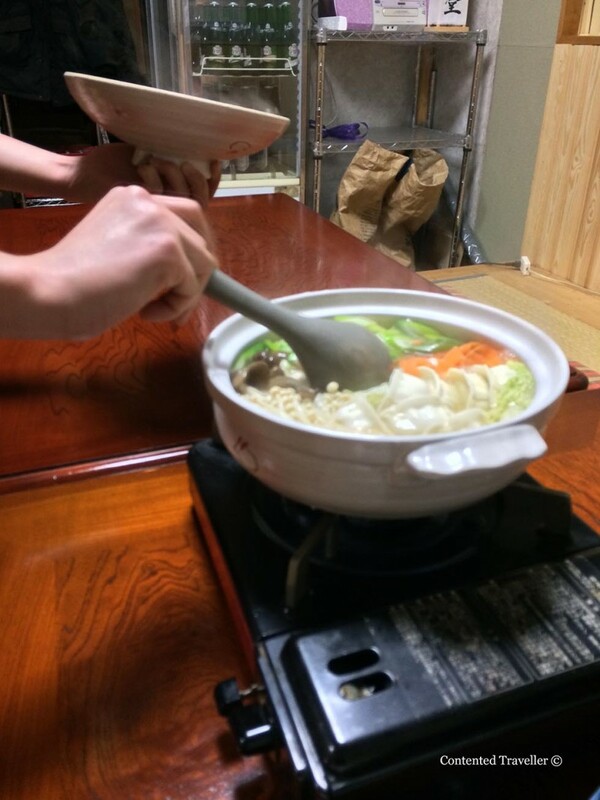 Farmers in Nagano turned to buckwheat or soba instead. 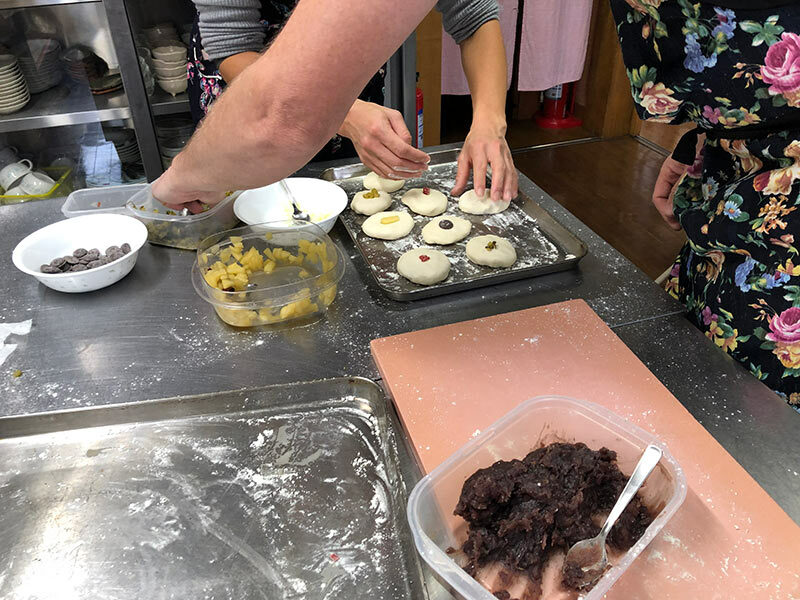 This flour was then mixed with water and filled with local wild vegetables and often seasoned with soy sauce and salt…and hence we get oyaki, steamed dumplings or steamed buns if you will. 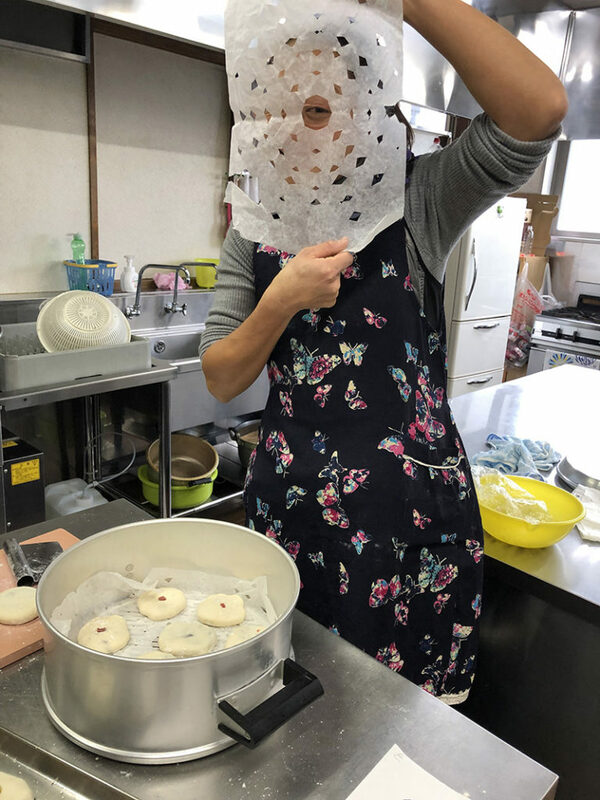 We learned, or tried to learn, to make Oyaki at Obake Cooking School with our delightful teacher Hiromi. Hiromi also teaches yoga and does many summer walking activities, such is the diversity of Nozawa Onsen. 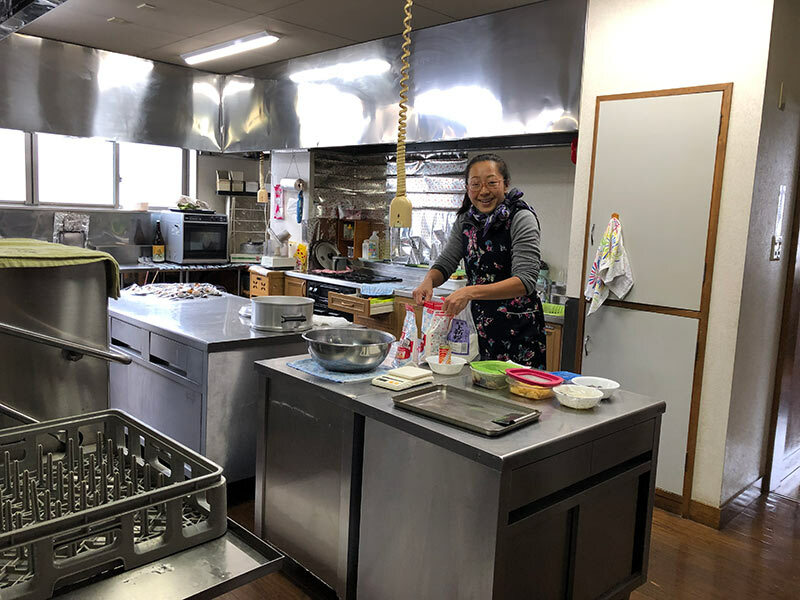 Her father runs the cooking classes on making the delectable soba noodles as well as cooking gyoza, and they run a delightful Japanese inn or ryokan. Learn about staying in a Japanese ryokan. We will do these other classes next year because I love soba noodles and I love gyoza. Interestingly the name of the ryokan is Obatake. Obake means hemp where they used to make rope, the faggots for the Dosojin Fire Festival, one of the most significant fire festivals in Japan, and to make the silk for kimonos. Obake is a guest house and many skiers and summer walkers and bikers stay there. and added 300ml hot water little by little . while kneading , added baking powder which you have mixed with a bit of water . Knead about for 15 to 20 mins to be a dough become soften like your earlobe. It is not as easy as it seems. 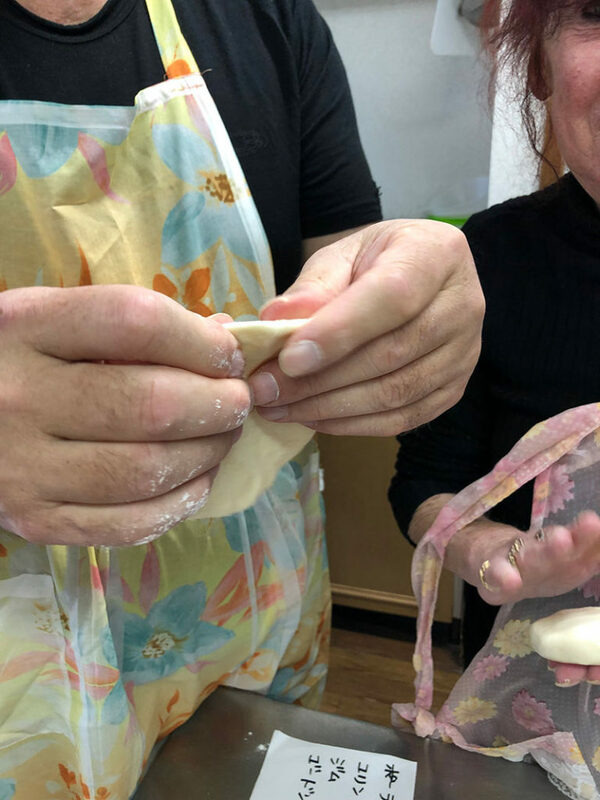 It is very tricky to get the dough in a round shape and even more difficult to fill and seal them. How did ours look? Disastrous. Did we have fun. Absolutely. 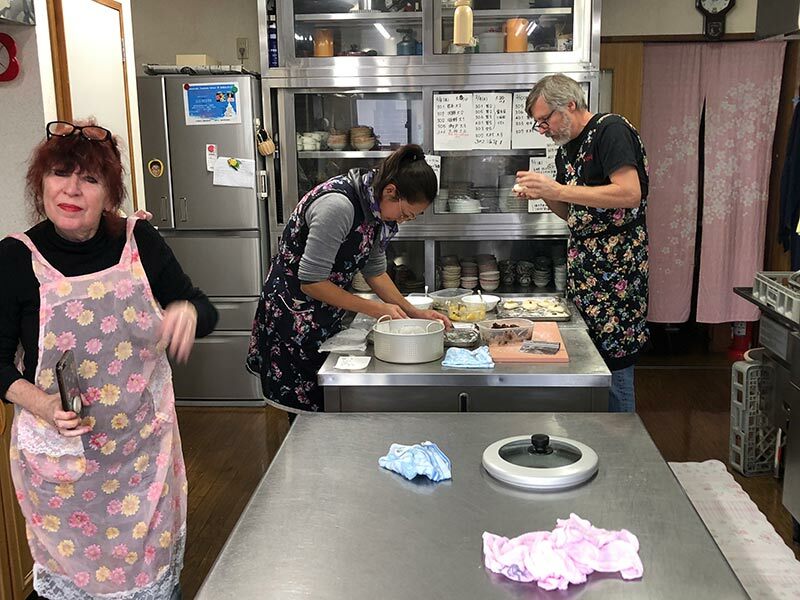 Do we recommend you do the oyaki cooking school … totally. The snow fell outside, we were being pampered by our teacher, we were in the middle of a family home with good friends, and making new ones …it was an amazing experience. 100% recommend. You are picked up from your lodgings. It cost just ¥3,900 when we did the class. You are also given snacks as you cook which is never a bad thing. This is exceptional hospitality from start to go. It is a fun time and you get to immerse yourself in not only a different cuisine, but to further understand another culture. It is a short shinkansen ride (bullet train) from Tokyo. 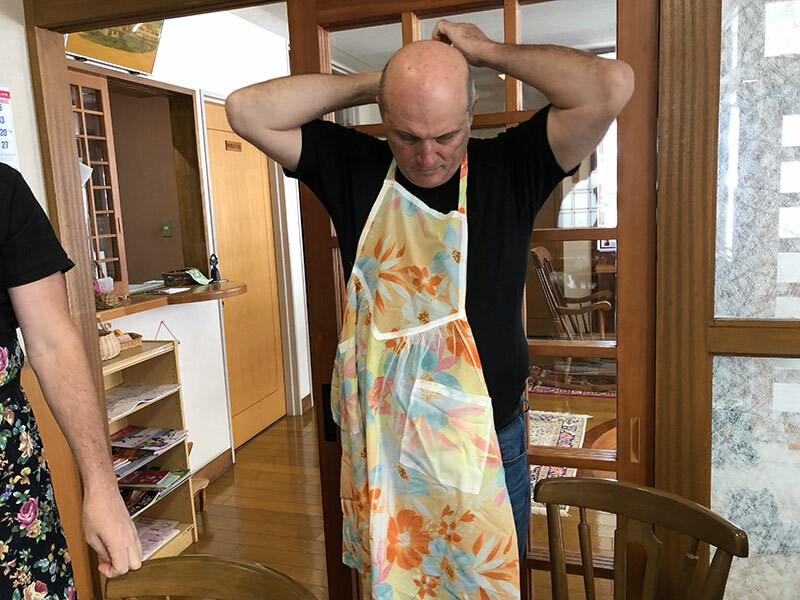 Should you do a Cooking Class on Making Oyaki in Nozawa Onsen, Japan? Yes.